RADICAL Cybertools is an abstractions-based suite of well-defined capabilities that are architected for scalable, interoperable and sustainable approaches to support science on a range of high-performance and distributed computing systems. 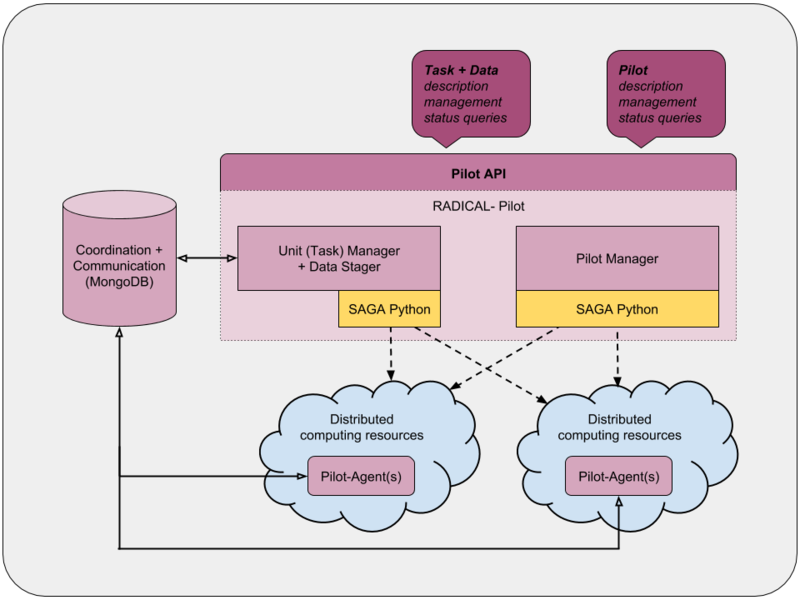 It currently consists of three components: RADICAL-SAGA: a standards-based interface that provides basic interoperability across a range of computing middleware; RADICAL-Pilot: a scalable and flexible Pilot-Job system that provides flexible application-level resource management capabilities, and Ensemble Toolkit that simplifies the ability to implement ensemble-based applications. RADICAL Cybertools builds upon important theoretical advances, production software development best practices and well defined usage and programming models. RADICAL Cybertools is also a vehicle for active cyberinfrastructure research, which enable its users to seamlessly reach the next level of scale and functionality. RADICAL-SAGA is the infrastructure access layer of the RADICAL Cybertools stack. It provides a homogeneous programming interface to the majority of production HPC queuing systems, Grid- and Cloud-services. 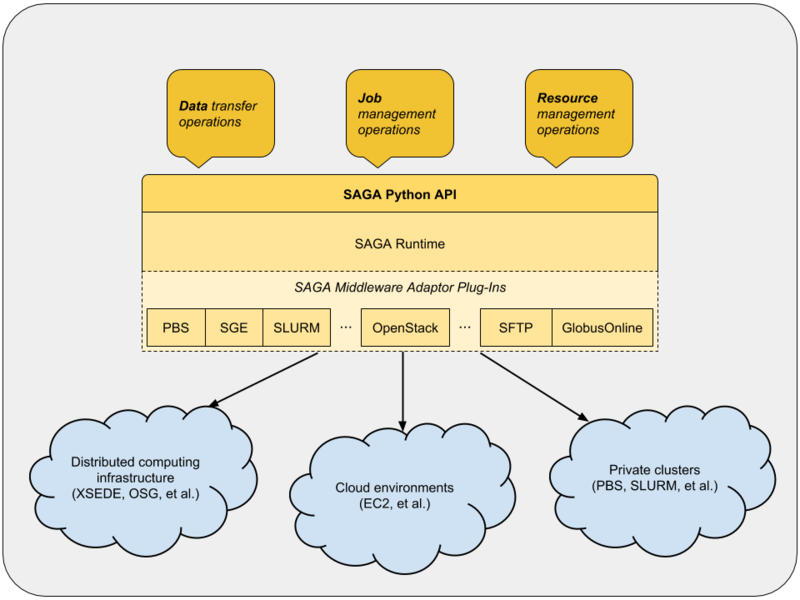 RADICAL-SAGA supports XSDE and OSG resources as well as academic and commercial cloud computing platforms. RADICAL-Pilot uses pilots in order to achieve the scalable execution of large numbers of tasks. A pilot is a job submitted to a machine in order to acquire exclusive use of a chunk of its resources. Once the pilot becomes active, it can execute the tasks specified by the user. Instead of having each task waiting on a machine to be executed, the user only has to wait once with a pilot! RADICAL-Pilot allows users to specify resources in the form of pilots and their tasks separately so the user can wait once and run everything. Ensemble Toolkit provides a simple way to develop applications comprised of multiple tasks and which adhere to pre-defined patterns. The tool comes predefined with common execution patterns so users can quickly adapt the toolkit to their needs; it is possible to define more complex execution patterns. 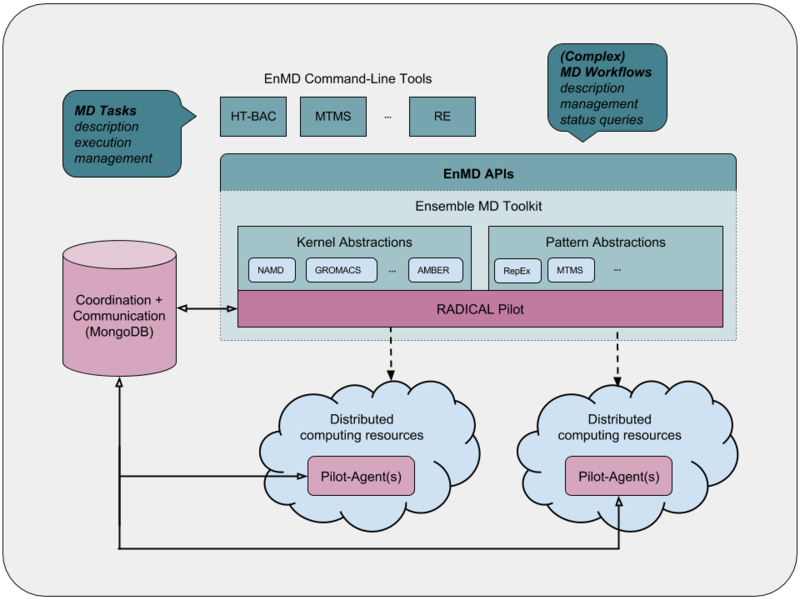 By building upon RADICAL-Pilot, the Ensemble Toolkit can take advantage of flexible and scalable resource management techniques.